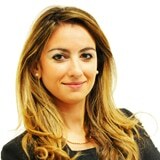 Dr. Stephanie Farrugia is a Senior Associate within GANADO’s Investment Services and Funds team assisting in the set-up of investment services providers, UCITS funds and professional investor funds. Stephanie completed her two-year trainee at GANADO Advocates in the Investment Services and Funds, Corporate and Banking and Finance departments assisting in the formation of companies, the setting up and licensing of investment services providers, in company law related matters, corporate projects, financing transactions and related security arrangements. Dr. Stephanie Farrugia assists in the set-up of investment services providers, UCITS funds and professional investor funds.